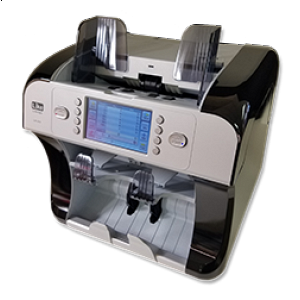 The LC-20 is Like's newest currency scanner which includes value and mixed note counting, note sorting with stranger rejection, facing and note orientation and triple counterfeit detection (Ultra-violet, Magnetic, and Infared). The 4.3" color touch screen allows easy use and navigation with user friendly icons and enlarged count result display. This unit includes USB, LAN and Serial connections with optional printer and/or remote display. Serial number recognition comes standard equipped on all units. New currency updates are easily handled with a USB thumb drive. Fast operation with up to 1300 notes/min counting in discriminating modes, 600 note capacity hopper, 200 note stacker and 100 note reject pocket.